Good location. Really cool that they have a security guard. Breakfast was delicious. Wifi should be stronger in the rooms tho. Overall felt like a hotel. You pay a hostel price for a hotel. 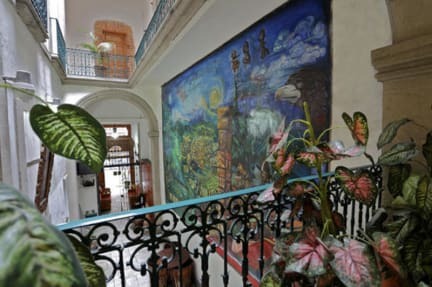 My sister and I had a great time here, but I would note that this hostel caters towards families and quieter travelers. 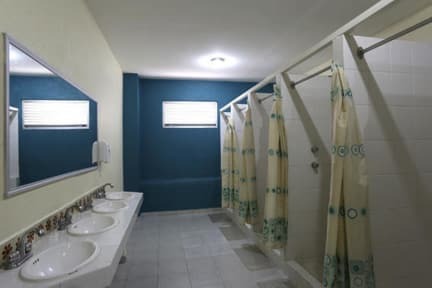 Advantages: in the middle of the historic center; great value; very clean; free breakfast from 8-10am; lockers; plenty of bathrooms/showers; and nice staff open to answering questions. We stayed in a private double room and found that the room could get a little warm during the day but cooled off during the night. Wifi was fine, considering it was free, but it could be faster. We stayed in a private room, so can't speak for the dorms. The staff were very helpful when we arrived early in the morning, allowing us to store our bags and speeding up our check in. The historic centre location is great for transport and sight seeing during the day. The breakfast was good with basic continental and a cooked item each day (eggs some days). This hostel is great value for money. Stayed here for 5 nights with my partner. Security guard on the front entrance which is great. There’s a nightclub next door so bring your earplugs for the evenings as they start playing music early! Staff are friendly, however didn’t go above and beyond. Place is clean, beds made frequently, probably could be cleaner. Breakfast was passable, location was great! No real social vibe, all kinds of people were staying here - young, old, and families. Wifi doesn’t work in the rooms and isn’t great! The 8.9 or whatever review that they proudly display is from five years ago, and might well be for the main location across the street from the one that I stayed at. The staff is rude. They badly need to learn the concept that the customer is always right. One example: When I checked in, the young woman had my passport, and I needed it to get the passport number to fill out the check-in form. I asked for it and she said "I need it, too." and didn't give it back until she was done. Wow. Location was great for the day, however there is an extremely loud nightclub next door that went very late. Almost hilariously loud and impossible to sleep, especially when combined with the fact that the windows of the room opened across from other windows, so when the automatic bathroom lights across from us turned on at all hours it was so bright I could read by the light (there were no curtains). The WIFI didn't work. The showers/toilets/beds were clean though, so that was good!! Except the location everything is awful about this place. No one speaks English. Wifi is only available in the common area which they'll kick you out if it,literally, after 12 am. They won't let you to smoke in the balcony after 12am. Breakfast was really bad! There was no soap in our room and we asked multiple times and they didn't provide us any. Even when you wanna drink water in the kitchen after 12am the guard will follow you and complain!!!! This place is terrible. Don't stay here! !